Are you using Game Explorer under Windows? The feature was introduced in Vista by Microsoft and has been carried over to Windows 7. The purpose of the feature was to provide users with a central hub for all their games. You may know that Microsoft is far away from that goal, as Game Explorer is anything but the complete package it should have been since day one. Not all games that are installed on the system will be added to Game Explorer. The majority of Steam games for instance will not appear there, as won't portable games and many other games that the service does not support. To make matters worse, it is not as easy as it could be to add new games to Game Explorer, or remove some of the games from the listing. If you ever tried to drag a Steam game shortcut to Game Explorer you know what I mean. 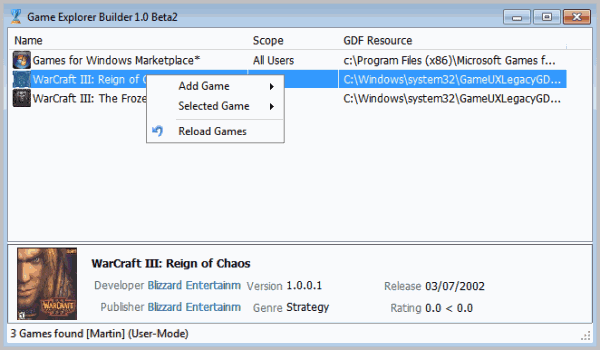 When you start Game Explorer Builder you will notice that it populates all existing game of Game Explorer automatically. You can delete game entries right away or double-click them to launch them on the system. Adding games is a somewhat complicated process, as you need to add multiple file links for each game before the game is added to Game Explorer. 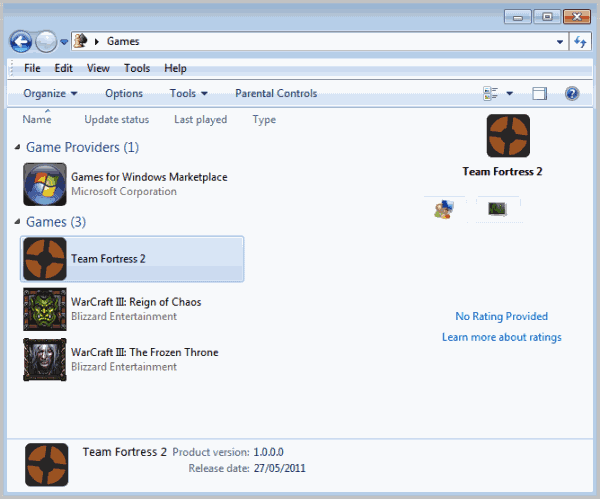 Here is a short guide on how to add the game Team Fortress 2 to Game Explorer. Team Fortress 2 is a Steam game and your efforts to add it to Game Explorer may have fallen short because of this. Right-click in Game Explorer Builder and select Add Game > Create Resource. 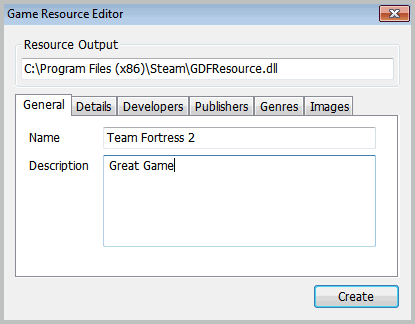 Click on Resource Output and select a directory for the GFDResource.dll file. Enter a name and description for the game under General. You can fill out Details, Developers, Publishers and Genres if you like, but do not need to as they are optional. Switch to the Images tab and click the Icon path afterwards. 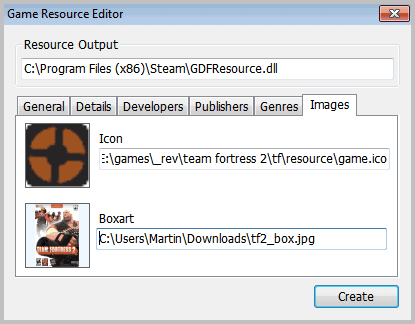 Navigate to your Team Fortress 2 > TF > Resource directory and select the game.ico as the icon. If you do not have an icon you may want to search on the Internet for it. Click the Boxart path and select the game boxart for inclusion. you may need to download the boxart from the Internet if you don't have an image depicting it on your system. Click on Create afterwards. This opens yet another configuration window. You need to add a shortcut to the game. Click the Add Record button under Shortcuts. A click on the Shortcut path opens the file browser. Navigate to the Steam folder and select Steam.exe. Activate Parameter afterwards and add -applaunch 440 to it. This launches Team Fortress 2. You can find out app numbers of Steam games by creating a desktop icon and looking at the shortcut afterwards. Click Ok and the Install on the Install Game Resource screen. If everything worked out fine, you should now see the Team Fortress 2 game in Game Explorer Builder, and your Windows Game Explorer. The program requires the Microsoft .NET Framework. I am using Windows 7 (x64) and I would like to say THANK YOU for this article. I have tried other editors, including “Vista Games Explorer Editor (VGEE)” and after a while searching around, this provides an alternative solution that works perfectly. Great article, fixed my annoying game explorer problems! Thanks!